The idea of painting a wall black, let alone any dark color, can send some people running for the hills. It might strike some as counter to any good decorative advice—wouldn’t dark walls make a room look smaller, colder, possibly more depressing? Our decorators are here to tell you that, contrary to popular belief, a dark room can do quite the opposite. From making a small room look larger to adding some beautiful contrast to your space, painting your walls dark might just be the best thing you ever did for your home. Below, we’re sharing fifteen spaces that show just how amazing a dark wall can look and why you might just want to consider it. A white marble fireplace is accented with the dark navy walls in J. Crew Creative Director Jenna Lyons’ Brooklyn home. Via Domino. Pops of neon color are heightened alongside the dark wall in this decorators. Via SFGirlByBay and Elle Decor South Africa. Beautiful furnishings and fixtures come to the fore against the dark backdrop of this office designed by Suzy Hoodless. A dark grey wall adds texture and depth to a modern, monochrome space. Designed by Maison Hand. Via Desire To Inspire. Emerald greens are given a vibrant look against the dark-hued paint of this room. Via Milk Magazine. Although exposed brick may be a selling-point in New York real estate, sometimes giving it a nice coat of dark paint can look even better. Via The Design Files. Dark blue walls give this room the air of a Dutch still life. Photographed by Pia Ulin. Via The Guardian. Designed by ODA Architects, this New York City residence uses black walls to embolden its industrial look. Via Architectural Digest. Deep aubergines and golds rub elbows in this moody room styled by Catherine Huckerby. Designer Fay Toogood defied tradition and covered her bathroom in a dark Moroccan tile. The look is both relaxing and romantic. Via T Magazine. White elements pop like stars against the black wall in designer Christine Dovey’s master bedroom. 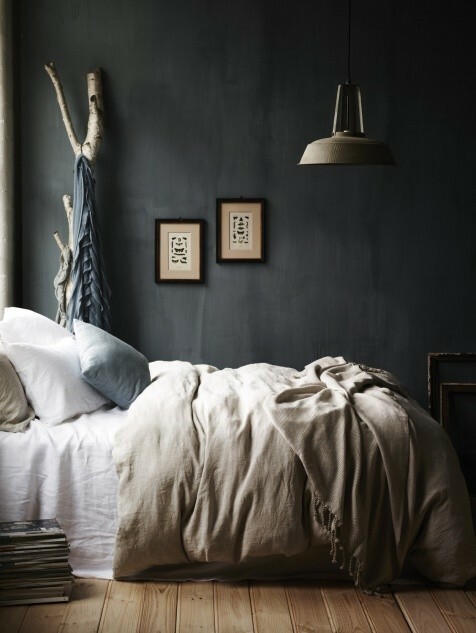 Dark walls can create a moody backdrop that enlivens natural elements like wood and linen. Styled by Derek Swalwell. Copper accents shine bright against the dark wall in this dining room. Via House & Garden. Furnishings and found objects are elevated to high art in the Greek home of collector Alketas Pazis. Via Yatzer. A textured grey wall diffuses light and adds romance to this room. Styled by Hans Blomquist. We’ve seen accent walls gaining momentum over the past few years, but nothing comes as close to the cool allure of this black painted accent wall. It instantly adds depth, a sense of drama, and inviting warmth. Follow suit from a small wall to a major one, for your own take on this thoroughly modern wall design. Graphic and defining, black trim may be a nod to the dining room era of the 1920’s, but it still looks refreshingly modern to this day. Imagine how bland and vacant the room featured above would be without the elegant appeal of the black painted trim. Because sometimes the unexpected can be the most inspiring, we love the sophisticated drama that a black painted room lends this otherwise all white kitchen. from a small bathroom to a large common area, a black painted ceiling is a brilliant way to introduce a dark hue in any room with ease with the key here being to keep the rest of the room grounded in stark neutrals. By painting window frames black, you quickly notice how much more grown-up and elegant each window looks as again, if they were standard white, they just wouldn’t have the same appeal. Add serious glamor to your stairwell by adding a dark color to it for extended drama that will make your home utterly unique. Plus, since stairs are heavy traffic areas, going dark will make keeping them clean all the easier. Now that we’ve made a case for the various ways you can create a dark painted wall or area, how are you planning on adding one in your home or space. From a small dose to full on, there are a myriad of brilliant ways you can add dark paint with confidence. The key, like with everything, is to plan according. But word to the wise, if you do go for a dark hue, make sure the surface you are transforming is smooth and blemish free as a dark paint color will only work to highlight flaws and problem areas. Ditto for high-gloss, shiny paint. Do however, keep in mind that while a high-gloss paint evokes timeless luxury, it is also hard to work with, and collects dust much more than any other paint color or type ever will.